The captivating sensuality of rich red roses, the warm and mysterious scent of woody essences. 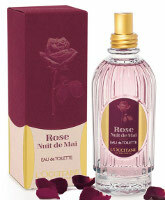 The Nuit de Mai Eau de Toilette evokes the atmosphere of those May festivities with a floral woody sensuality. Rose Nuit de Mai was developed by perfumer Alexis Dadier, and the notes include wild rose, cinnamon, violet, blackberry, cedar, sandalwood, vanilla and musk. And coming in June from L'Occitane, Thé Bergamote / Bergamot Tea (shown above right), a new unisex fragrance in their popular tea series. The fragrance notes feature black tea, bergamot, mandarin, grapefruit, cardamom and woods. Other recent launches from L'Occitane: Peach Blossom. As much as I love roses, and would love to love rose perfumes, the majority end up disappointing and dry down winey. However, I am absolutely thrilled to try any new tea scent; throw in some beramot and I’m a happy girl. And a 20ml size? perfect. I love rose perfumes, but most excited about the Bergamot Tea myself! I think I’ve liked their “low end” efforts better than their “high end” efforts like the Notre Flore collection, but it’s always worth trying whatever they do. bergamot + tea? wouldn’t earl grey be a better name? Was wondering about that. Maybe “Earl Grey” is not so widely known as it once was…perhaps young people would have no idea what that was? And in the US, perhaps even older people…tea is not so big here as it is in the UK, although green tea has become very popular over the past few years. Ah good point. Everyone drinks tea here – well, nearly everyone (no milk or sugar, thanks). A cuppa is the answer to all the problems life can throw at you! I suppose I don’t think about how much tea anywhere else drinks – I think my Nana would probably hold the world record for cups of tea per hour if she bothered to enter! I must rival your Nana…I drink tea all day & well into the evening. I’d hate to count how many cups I drink! But it’s mostly green tea. True! My son & I are going to watch the very last episode tonight…then we’re on to Voyager! As much as I love John Luc, this is why I always thought Janeway was tougher because she’d drink black coffee. Tougher, but with less stomach lining…..
Janeway is my next favorite captain. I can’t imagine a French company calling anything Earl Grey! Oops! Oh well! They’re a tea company, so perhaps they’re exempt. My dad is French, and that French/English rivalry runs deep! Oh, and regardless, I’d still love to try the fragrance. I’m definitely on a tea scent search. Definitely will be popping into my shop in June to try some of that Bergamot Tea. And Hallelujah! for the 20ml bottle. NOW… if we could get them to re-release Green Tea w/ Jasmine & Green Tea w/ Mint in that size. HA…but you know I don’t need it, I just like to complain! Oh yay! I was about to say I could go for the Citrus Verbena in a small bottle too…but went to look first, and voila! They do! Out of stock, of course, but hey…I can wait. 20 ml bottles are such a great idea, aren’t they? I’m all stocked up on rose these days, don’t need another one. But the Bergamot Tea sounds fab: put Earl Grey in a bottle and I’ll wear it! Decaf Earl Grey, decaf black chai, green tea with lemon, Tazo Wild Sweet Orange, peppermint leaf. Along with a handful of Constant Comment, and two boxes of family-size decaf black teabags… because we are southerners who cannot live without our gallon of sweetened iced tea in the fridge. I admit to gradually cutting down the sugar in the tea; husband hasn’t noticed yet, SHHHH! Much as I adore tea of all kinds, I’m not big on smelling like it. I’ll have to head over to my local shop and give the rose a try; as yet I don’t have a really good rose frag in my (small) collection. You know, I thought that Body Shop rose was nice too, although I didn’t get to try it on skin, only paper. Yay! for another tea scent to sniff. And 20 ml size is great. The rose sounds pretty, but not something I really need to have. But the ad copy makes my over imaginative mind wonder and then the boozy skanky rose scent Une Rose seems much more fitting for what debauchery might be occuring by those bonfires and rose covered maypoles. Hey, Une Rose is a perfect fit! These both sound worth trying. I particularly like the sound of cardamom with my bergamot. And isn’t the packaging/labelling pretty! Yes – that’s a great bottle! Don’t love the rose one though. Cardamom, bergamot and black tea are my favorite scent notes, so I will definitely be checking this out. However, since my last trimester began and my nose (and stomach) are back in the game, I’ve been spending too much! Hey, when are you due? Got about 5 more weeks to go, thank you for asking. This is my second, another girl. I’m getting excited! I like L’occitane. To me bergamot tea equals earl grey – which is my favorite kind of tea! I will be sure to check this out. I like L’Occitane too. Although admittedly, since their prices have gone up, I like them less. Ha. I’m a big fan of L’Occitane and have six of their fragrances. They are all well constructed and have a house signature to them. I’m looking forward to smelling their new rose offering as they seem to have a knack with rose in my opinion as Eau des Quatre Reines is one of my favourite room fragrances. Hope it will live up to your expectations then! Tried the Rose Nuit de Mai not with much hope, as L’Occitane EdTs often lack elegance and good measure, but I was very pleased this time. The rose is well rounded by the vanilla, and deepened by some warmed wood. Indeed the fragrance suggests the aromated and warm May evenings. I am a big rose fan and I try whatever “rose” comes up. Ths one is on my buy list – even though L’Occitane has ridiculous high prices for what they are. Glad to hear it’s nice…and I’m not happy w/ how expensive L’Occitane has become either. Bergamot Tea just arrived! Has anyone tried it yet? Not I, but thanks for the tip — didn’t know it was in store yet. Did you try it? I did, and like it quite well. At first it seemed really weak, but came out stronger after it had been on skin a little longer (backwards? oh well). I wouldn’t call it a masterpiece, or terribly original, but for what it is (a nice addition to the summer rotation), I really like it. I bought the 20 ml packaged w/the shower gel and body spray. Thanks! I think Kevin didn’t love it but don’t know if he tried it on skin or not. I just made my mom order me a whole bunch of everything from the bergamote line. My bday is coming up June 22nd. I hope i like the scent of it because we ordered every single product from this line! even solid perfume & potpourri. The thing is I LOVE tea & tea scents, and my favorite kind has always been earl grey!!!! Anything Earl Grey I will buy without even sniffing it. Becuz even if it doesn’t work with my skin chemistry, Ima still find a use for it. Like I will scent my sheets or somethin. I doooo love the packaging of Bergamote The. This is a total keeper!!!! I cannot get over how GOOD The Bergamote smells. Once again, I was right about buying a tea scent. This is EXACTLY what I was looking for! Citrus opening of my beloved bergamot, deep heart of smoky tea – this fragrance is just my cup-o-tea. For L’occitane it’s long-lasting and of course I don’t expect it to stay on my skin for as long as for example Kenzo Jungle does… I already used 1/5th of my o.68 oz bottle and I think I need to order a large bottle very soon. I try to keep my hands away from The Bergamote, cuz I can’t help it but use it every single day, every few hours… I just wanna keep smelling it all the time! So glad you love it — I really need to get to the mall & try it! And sorry I missed your earlier comment above. I had a great day yesterday – purchased 3 fragrances, including this one. The other two [Bvlgari Jasmin Noir and Gucci by Gucci] I’m saving for cooler weather and this one will be my ‘go-to’ scent for the rest of the Summer [now that Summer has finally arrived]. This is so refreshing and addictive! You just can’t help constantly putting your arm up to your nose. I still haven’t tried it…have to get on the ball!